A Belgian designer has been awarded Designer of the Year every year since 2006. Past laureates include Nathalie Dewez, Vincent Van Duysen, and Stefan Schöning. This year, the title goes to design studio Unfold, founded in 2002 by Claire Warnier and Dries Verbruggen. 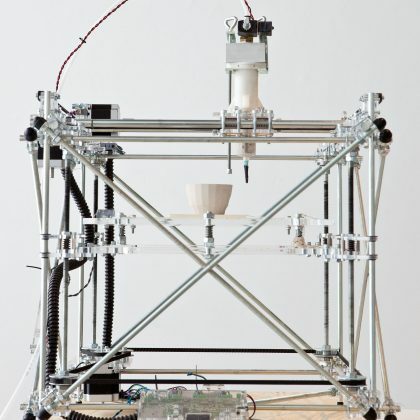 Unfold garnered global recognition with the l’Artisan Electronique project (2010), a 3D ceramics printer with a virtual pottery wheel. They call into question the conventional roles of designer, author, producer, and consumer and in a critical manner combine artisanal know-how, high-tech production models, and recent digital evolutions. Unfold challenges us to consider these new connections and how we wish to further ‘design’ our future. At the occasion of this award, a twin exhibition is organised at Bank Delen in Antwerp (27.09.2017 – 22.10.2017) and at Design Museum Gent (27.10.2017 – 4.03.2018).